Good customer service can be the difference between being able to compete and survive and failing for small businesses. So I'm continually amazed at how many small business owners take a "wing and a prayer" approach to good customer service in their business; they hire what they think are good people and just assume that they'll do the right things – often without even bothering to do any customer service training. This guide is designed to take a more systematic approach. The articles here will teach you what good customer service is and give you tools to assess and improve customer service in your small business. A definition of customer service – so much more than just a face-to-face interaction. Following these eight simple rules will ensure that your business becomes known for its good customer service and allow you to reap the benefits that good customer service provides. Albert E. Schindler shares his secrets for providing good customer service, including how to build business customer loyalty. The big money isn't as much in winning customers as in keeping customers - and the key to keeping customers is the level of customer service you provide. Liz Tahir presents ten tips that will keep them coming back. The telephone is the first point of contact with customers for many businesses. But if you don't answer the phone the right way, you'll lose business instead of gaining it. Here are "winning ways" to answer the phone. What are your tips for good customer service? Add your answers to the tips on this page. By listening carefully to customer complaints, we can identify opportunities for training employees, improving products and services, educate customers - and improve our business's bottom line. Mary Sandro explains how to turn customer complaints into opportunities. Too many customer service representatives are sabotaging businesses because they can't resist getting the last word in. Kelley Robertson explains how to keep customer complaints from escalating into customer crises that hurt your bottom line. 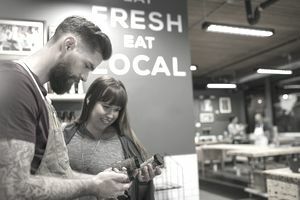 To make the store return a positive customer experience, you need to be sure both your return policy and your return process match your customer service goals. These tips for handling store returns will ensure you're providing customer service rather than a disservice. Have you ever run into problems that resulted in a tense relationship between you and a client? Marshall Zierkel explains how to smooth things over, minimizing conflict as it arises and adding value in your clients’ eyes. To find out if your business is providing the good customer service you want it to provide, you need to get some outside views. Here are some tips for finding out what your customers and/or clients think of their interactions with your front-line people. This short questionnaire is designed to provide insight into the transaction between your business's staff and your customers. It's a general customer service survey that you can use to get feedback about face-to-face interactions. How do you find out what they're doing or what they want? Here's how to do your own market research to stay on top of the competition and in touch with your customers. This makeover focuses on making sure that your small business provides the kind of customer service that builds customer loyalty, gives positive word-of-mouth advertising, and increases sales – in short, the good, better or even superior customer service that consumers want.